Last week the Italian Trade Commission welcomed wine journalists and members of the trade to VINO 2015, Italian Wine Week. It was billed as the Greatest Italian Wine Event Held Outside Italy: Celebrating the Wines of Southern Italy. There were a number of seminars on Italian wine and other events and a Grand Tasting. Slow Food/Wine which has a Slow Wine Guide of the 400 best wineries in Italy was also holding a Grand Tasting billed as Slow Wine/Vino 2015. Both Grand Tastings took place over a two-day period at the Waldorf Astoria. At the Grand Tastings there was an ocean of wine but I did my best to taste as many as I could. There were a number of new discoveries and many old friends. 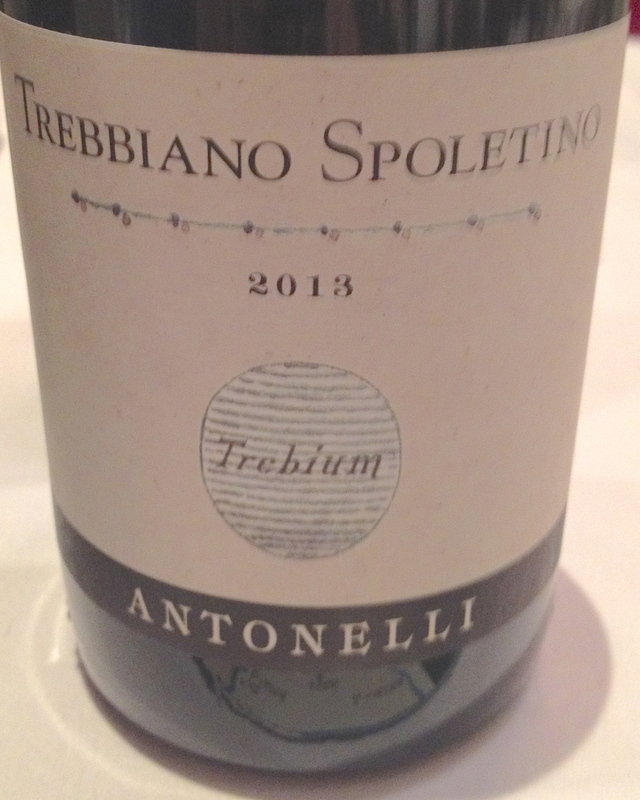 Trebbiano Spoletino, made from 100% Trebbiano Spoletino (a white grape variety native to the area around Spoleto). A hand selection of the best grapes in the vineyard which is at 300 meters with a western exposure. Filippo cultivates the vines as they did in ancient times next to maple trees in order to make the grapes grow higher. The vines are attached to the trees keeping them well off the ground so that the late frost in the region does not affect them. The harvest takes place in October. Soft pressing is followed by skin contact and cold static clarification. Fermentation is in 25 HL oak barrels. Aging in 25 HL oak barrels and 3 months in bottle before release. The wine has floral aromas with hints of tropical fruit, almonds and spice. It is well balanced with good acidity. 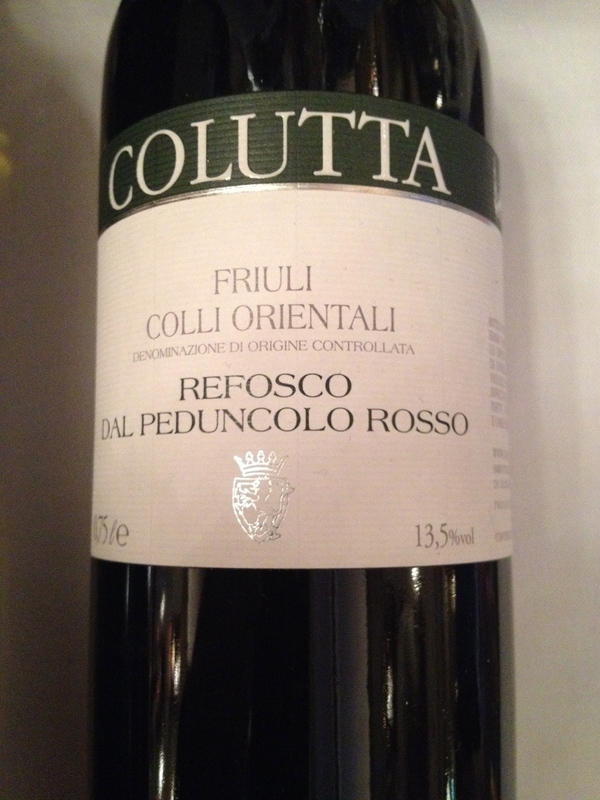 Colutta from Friuli is a producer I do not know so I decided to taste his wines. Giorgio Colutta was there and he told me about his wines and winery. He makes a number of wines including a Sparkling Brut from the Ribolla Gialla grape. I liked the whole line. The Refosco was one of the best I ever tasted. Refosco made from 100% Refosco del Peduncolo (Red Stalk). There are 3,000 vines per hectare. The grapes are hand harvested, destemmed, crushed and fermented at a controlled temperature in stainless steel tanks with additional selected yeasts. Déslestage (rack and return) takes place. After 10 to 15 days the grapes are soft pressed. Part of the wine is aged in barrels and part in stainless steel. This is a wine that needs time. It has hints of wild blackberry, plum and other black fruits. I have always been a big fan of Badia a Coltibuono Chianti Classico. Emanuela Stucchi Prinetti was there and she told me I have to taste this wine made from very traditional Tuscan varieties. 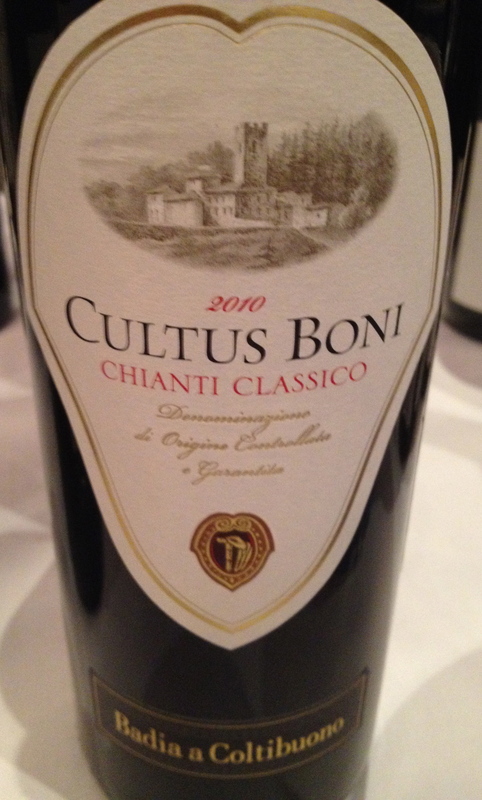 Chianti Classico “Cultus Boni” 2010 made from 80% Sangiovese, Colorino, Ciliegiolo, Fogliatonda, Malvasia, Sanforte, Mommolo and Pugnitello. The geographical area is Monti in Chianti and the vineyards of Montebello and Argenina. The vineyards are at 260 to 370 mt. and the exposure is south, southwest. Soil is clay and limestone, vines are 10 to 35 years old, and training system is guyot. Manual harvest. Natural fermentation takes place with native yeasts, maceration for about 40 days on the skins. Aging is in French Oak barrels of various sizes. This is a full-bodied wine with red fruit aromas and flavors and hints of cherry and violets. A friend asked me to taste the wines of a Sicilian producer and then give my opinion of the wines. The producer is Alliata and I told him that I liked the wines after tasting them. They make wines from the Insolia, Grillo and Nero d’Avola among others. The Insolia is made from 100% Insolia in northwest Sicily. The soil is clay and pebbles and the vineyard is at 200 to 250 meters. There are 5,000 vines/ha and they use a vertical trellised training system. Harvest takes place the first two weeks of September depending on the maturity of the grapes. Extremely soft pressing takes place with a membrane press at a controlled temperature in stainless steel tanks. The wine ages for 4 to 5 months in stainless steel tanks on the lees. It is released after 2 to 3 months in bottle. Brunello di Montalcino DOCG Riserva “Poggio all’Ora” 2009. Castello Banfi. Made from 100% Sangiovese, estate selection. The Poggio all’Ora vineyard is on the southern slopes of the Montalcino hillside at 250mt. The wine is produced only in excellent vintages based on a meticulous selection of the harvested grapes. Temperature controlled vinification is in Horizon hybrid stainless steel and wood tanks with skin contact for 12 to 14 days. Aged in barriques for 30 months, and at least 12 to 18 months in bottle. The wine is kept for a total of five years before release. This is a wine with notes of violet and hints of plum, jam and a touch of coffee. I was very impressed by this wine and even though it spends a long time in barriques, the usual tastes associated with these barrels was not present. 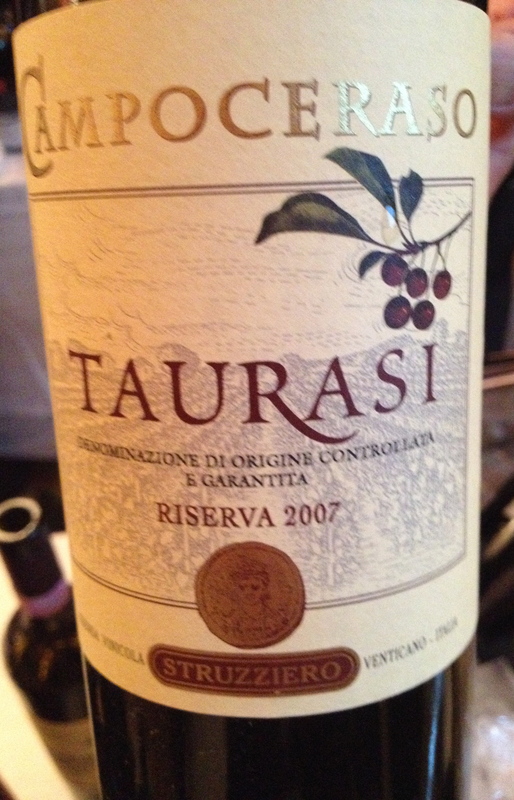 Taurasi “Campoceraso” 2007 DOCG Azienda Vinicola Struzziero Avellino, Campania. 100% Aglianico. I had not tasted wine from this producer in some time so I stopped to see if they were as good as I remember them. The vineyards are on the Colline Venticano hills and Torre Le Nocelle. There is controlled fermentation with 25 days of maceration. The wine is aged in oak barrels for at least 36 months. The wine remains in bottle for about six months. This is a wine that can age. It has hints of red fruit, spice, coffee and tobacco. It is a balanced wine with a full aftertaste and long finish. I was happy to see that the wines were as good as I remember them. 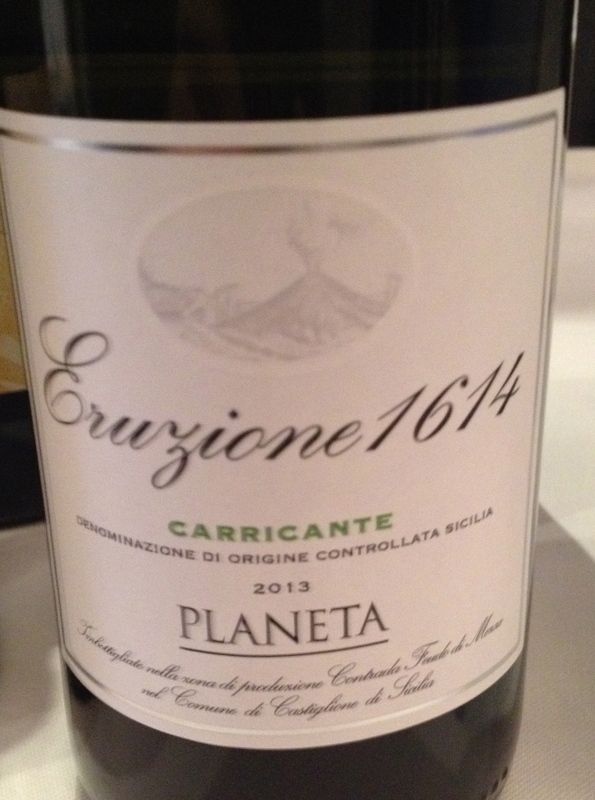 Planeta – The winery has different locations around Sicily and I have visited most of them. This wine comes from the Feudo di Mezzo location close to Mt Etna. Eruzione 1614 Bianco DOC vintage 2013 made from 95% Carricante and 5% Riesling grapes from the Sciara Nova vineyard in Castiglione, Sicily. The soil is black lava (Mt. Etna) and the training system is vertical trellis, spurred pruned cordon and guyot. There are 5,000 wines per hectare and the harvest takes place on October 6th. Grapes are picked and refrigerated at once at 8 degrees and a hand selection takes place. After a light crushing and destemming the grapes are soft pressed. The decanted must is racked and inoculated with yeast, then fermented at 15 degrees for 20 days. The wine remains on the lees until February with continuous mixing and is bottled in March. This is a white wine that will age and should not be drunk until at least 3 years after the vintage.